Rate per game is computed based on the time each game started. Shoe Rental of 350 yen is not included in the above rates. Above-listed rates may change without prior notice. Regular game cannot be converted to Nagehodai package during the game. Only the registered player per package is allowed to play. If another person aside from the registered player plays, he will be charged separately with the full package fee. Nagehodai package cannot be converted to Regular game during the game. Along Kanpachi-Dori, drive from Kokudo No. 17 going towards Highway No. 5 and turn left at Kanpachi-Kousoku-Shita intersection. At the West Exit Rotary, look for bus stop no. 8; Get on the bus going to "Nerima Station" (Bus line No. 01); Get off the bus at "Shimura Shoubou-sho" (12th bus stop). The trip is about 20 mins. and costs 210 yen. 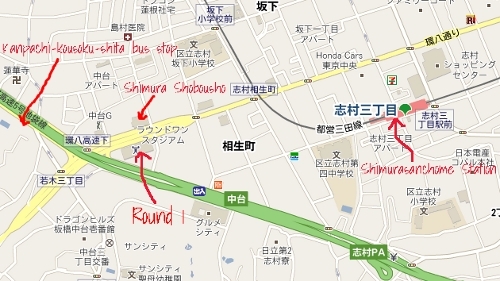 At the North Exit bus station, get on the bus going to "Ukimafunado Station" (Bus line No. 02); Get off the bus at "Kanpachi kousoku-shita" (8th bus stop). The trip is about 10 mins. and costs 210 yen. 7-min. walk from "Shimura-San-chome station" of Toei Mita Line.